Genre: Young Adult, Paranormal, Post Apocalypse. 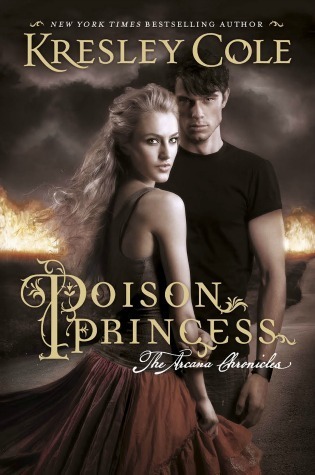 Poison Princess has been on my radar for a couple of years now but I had absolutely no idea what it was about. I saw a book trailer for it earlier this year (which I can no longer find) and it looked awesome, so I bumped it up on my wishlist. I was lucky enough to find it this past weekend, secondhand for $5 and I couldn’t resist. I’ve seen very mixed reviews about it – some people I know really liked it and then others didn’t. I wasn’t sure where I was going to sit on that spectrum, even 200 pages I didn’t know what I thought about it. The first part of the book was kind of boring and I probably would have stopped if I hadn’t ahd Michelle sitting across from me and telling me it got better. She was right. There were still parts I didn’t like. Some of the characters I felt very meh about, and there were others that I wish we’d gotten to see more of. I think one of the most surprising characters was Evie, herself. For ages I hated her, I thought she was weak and pathetic and whiny but the end completely changed my opinion of her. I hope we get to see more of that Evie. I thought the plot was absolutely great. I love post apocalyptic things anyway but the paranormal twist just made it for me. It was such an interesting world and I can’t wait to see where Kresley Cole is going to go with the rest of the series. I also really liked the French/Cajun element within the book. It’s not very often that you see that done in YA and so it was a nice little addition to the story. All in all, I would definitely recommend them if you’re interested in post apocalypse or paranormal novels, or if, like me, you really like fictional boys on motorbikes.